Jon's journey with percussion began in the late 1980's. After buying a darabuka in Cairo, Jon initially learned through playing with musicians he met during his travels. In the early '90's Jons travels took him to India, where he encountered Indian tabla. This began several years of study & practice with tabla teachers in India & the UK. Since the early 1990's, he has explored and experimented with instruments and concepts from various musical forms, particularly drawing from the North Indian, Middle Eastern and West African rhythmical traditions. Instruments played: tabla, tabla tarang, darrabouka, daf, cajon, riq, udu, mouth harps, djembe, shakers, woodblocks etc. Jon works as a freelance musician, primarily as a performer, but also works as an instrumental teacher, session musician and delivers workshops in schools & colleges & is an Associate Lecturer at the University of Plymouth. Jon's music often explores combining rhythmic ideas and techniques between different instruments and musical forms, both in his solo work and in collaborations. He also combines this with technology through computer based studio recording and his unique live sampling performances. He has performed with various artists and groups including multi instrumental duo Taaliqa, the duo Tandj , based on South Indian devotional music, as well as Indian classical music, and 'Drumscapes' - his unique solo multi-percussion live sampling performances. In 1997 Jon was the musical director for a Theatre project with East Glamorgan Polytechnic on a piece performed at Glastonbury festival. In 2007 Jon worked as the musical director for Attik Dance company, based in Plymouth, on the 'Clean Sweep" project which was performed across the South West UK. Jon has also collaborated a number of times with dancers at the 'In The Flesh' events held at the Barbican Theatre in Plymouth, using live percussion sampling. Jon's tabla tuition began in Cardiff with Harjinder Singh Matharu from Birmingham. Harjinder gave Jon a good solid foundation in tabla playing between 1994 - 1998 as well as the encouragement & inspiration to commit himself seriously to the instrument. In 1994 / 1995, Jon returned to India where he learned from Shivanand Bhandari at the Naadashree Arts Institute in Kumta, Karnataka, India. 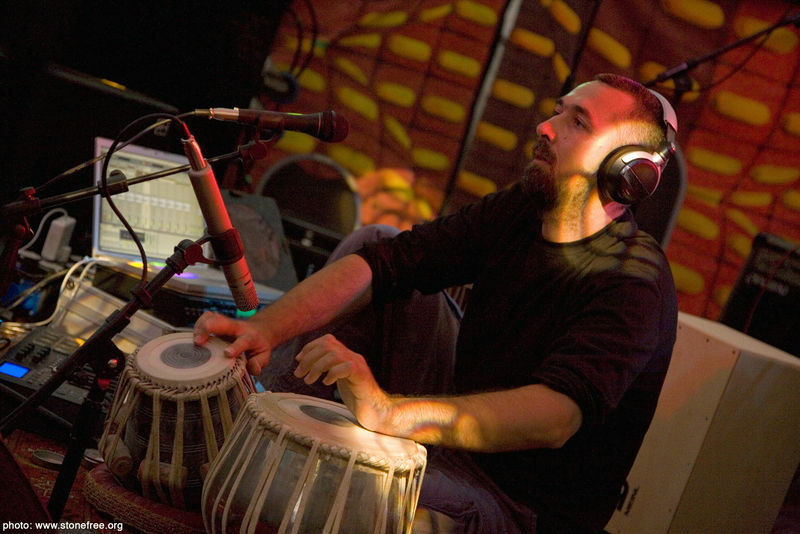 In 1998 & 1999, Jon returned to India and studied with Kailash Nishad in Benares, (Varanasi) in North India, a city renowned for the study of North Indian (Hindustani) music. Kailash's teaching and playing has been a major influence to Jons own playing. Jon's other musical studies include completing a BA ( Hons ) Music degree at Dartington College of Arts in 2000, where his main subject was in composing music for live performance. Jon performs in arts centres, music venues, festivals, Melas etc. as well as private events such as parties, weddings, functions etc. throughout Devon, Cornwall, Somerset, Dorset, South Wales, Bristol & across the South West, and is available for performances & workshops throughout the UK.
" . . .The brilliant sitar of Ricky Romain in duet with Jon Sterckx's tabla wizardry was a first class example of musicians "playing off" each other, their evident joy never becoming indulgent, and never compromising the aims of the music. . . ." - Colin Sell. "Thanks so much for playing at our night for RESPECT - I thought you were amazing - a hypnotic, almost trance-inducing performance..." - Sound Gallery, Exeter.